How well does Executive Order (EO) 13771 address reform proponents' concerns? What challenges does EO 13771 present from an implementation perspective? The early days of President Donald Trump's administration were characterized by a burst of activity meant to roll back regulation, including Executive orders (EOs) to regulate the U.S. financial system, enforce a regulatory reform agenda, and reduce regulation while controlling regulatory costs. These reforms, particularly EO 13771, can potentially affect every part of the economy touched by federal regulation through the Office of Management and Budget's (OMB's) annual review of regulation. This Perspective considers how well EO 13771 addresses the concerns of those who have long supported regulatory reform and how agencies and OMB might best face the challenges and opportunities associated with implementing regulatory reform. While it does seek to reduce costs, it does little to address proponents' concerns that bureaucracies have tended to overestimate benefits and underestimate costs. The EO does provide a mechanism for requiring regulators to prioritize between alternative regulations, but the process regulators will likely use to make those decisions is the same process that proponents of regulatory budgets argue is biased. While aspects of reform, such as the call for retrospective analysis in EO 13777, can be a key part of instituting the cultural changes necessary to make a regulatory budget effective, the "two-for-one" approach of EO 13771 reinforces a regulatory mindset that focuses on which regulations to cut rather than how to most efficiently reduce regulatory burden. Without further changes in guidance, regulators are unlikely to focus on the kinds of changes in how to regulate that have accounted for most of the cost savings generated by the UK's regulatory budget. Implementing a regulatory budget comes with many practical challenges, such as determining how nonmonetary costs are to be considered. Encouraging agencies to put more resources toward reconsidering existing regulations can reduce unnecessary costs, but forcing agencies to reduce costs by a set amount risks the elimination of regulations with positive net benefits. Policy changes, such as retrospective analysis, can help address concerns about the accuracy of current cost-benefit analyses if those policy changes are focused less on what to regulate and more on how to regulate. Policy changes also need to include consideration of the regulatory culture with appropriate changes to the reward and recognition system to ensure career support for regulatory experts involved in retrospective analysis and changes in the "how to regulate" mindset. Policymakers should remember that regulations are not necessarily harmful to industry. The reputation of quality held by U.S. regulations imparts a competitive advantage to U.S. businesses. Removing or preventing the creation of beneficial regulations could directly harm U.S. businesses. This project is a RAND Venture. Funding for this venture was provided by philanthropic contributions from RAND supporters and income from operations. 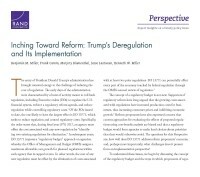 Miller, Benjamin M., Frank Camm, Marjory S. Blumenthal, Jesse Lastunen, and Kenneth W. Miller, Inching Toward Reform: Trump's Deregulation and Its Implementation. Santa Monica, CA: RAND Corporation, 2017. https://www.rand.org/pubs/perspectives/PE241.html.